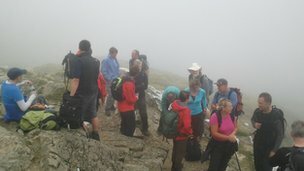 A group of MPs have walked up Snowdon, hoping to capitalise on the "Olympic effect" to get people off their sofas. The nine are part of the All Party Parliamentary Mountaineering Group set up earlier this year. The British Mountaineering Council (BMC) is keen to get the MPs backing for walking as a hobby at a time of renewed interest in outdoor sports. It says that as well as promoting health it boosts the local rural economy. Elfyn Jones, the access officer with specific responsibility for Wales with the BMC, said the walk provided an opportunity to speak to MPs about Welsh mountaineering. Did they claim this on their expenses? Surprised they did not do a U-Turn half way up.